As unique marketing opportunities, webinars are effective lead generation tactics in online business. Webinars simplify drip campaigns and conversions, especially when combined with effective database management. In the online world, where time is the greatest commodity, webinars are one of the best values for serious results. But you must be sure to choose the right webinar software. In this post I am going to introduce you ClickWebinar, a platform you can use to run videoconferencing and webinars for up to 1,000 attendees. You can register at ClickWebinar without credit card and start your free 30 days trial right away. After you sign up, be sure to confirm your email, to begin using your account. First, you want to complete the profile settings. You can create a personal page, adding your picture, website, address or bio. I like the ClickWebinar dashboard : it’s really intuitive! You can organize your first webinar, in a matter of minutes. Just click on “Host a Webinar” button, in the right side of your dashboard. You may want to start your event right away or schedule for later. 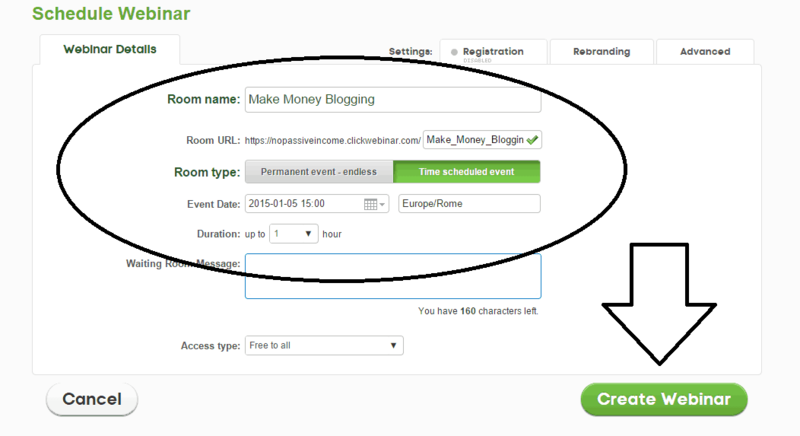 Basically you want to add a “room name”, which will be reflected in the room URL. Set the event date and the time zone (very important). 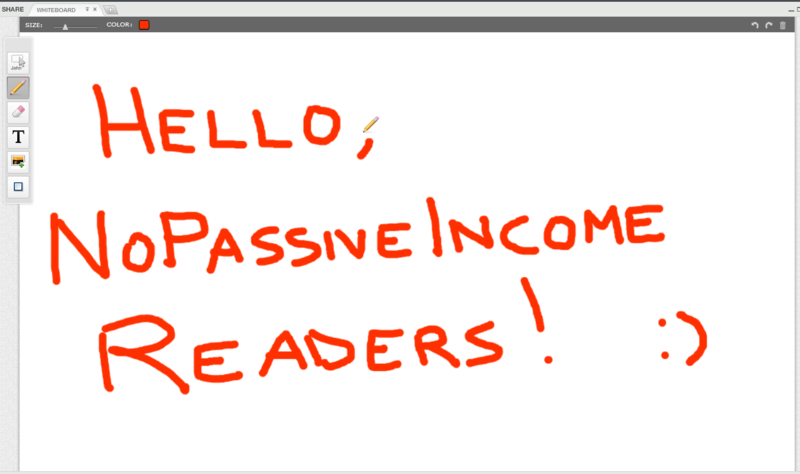 Decide the duration of the webinar and eventually write a “waiting room message”, which will be displayed for users coming before the planned start time. In this way, attendees will know to be in the right place. Also, you can allow access type to free for all, or with password/token protection. Here is a summary of your webinar, with all the details you added in the previous step. There’s the phone access detail, with the presenter and participant PINs. Here you can invite participants or presenters, by clicking on the “invitations” link (you may want to use social media for invites, like your Facebook account). Also, it’s good to set a reminder for attendees (I’ve set mine 2 hours before the start of the webinar). Finally, you want to embed the room in your website, by importing the script code, as shown in the image below. Now, you are ready to prepare your presentation, by visiting your webinar link. 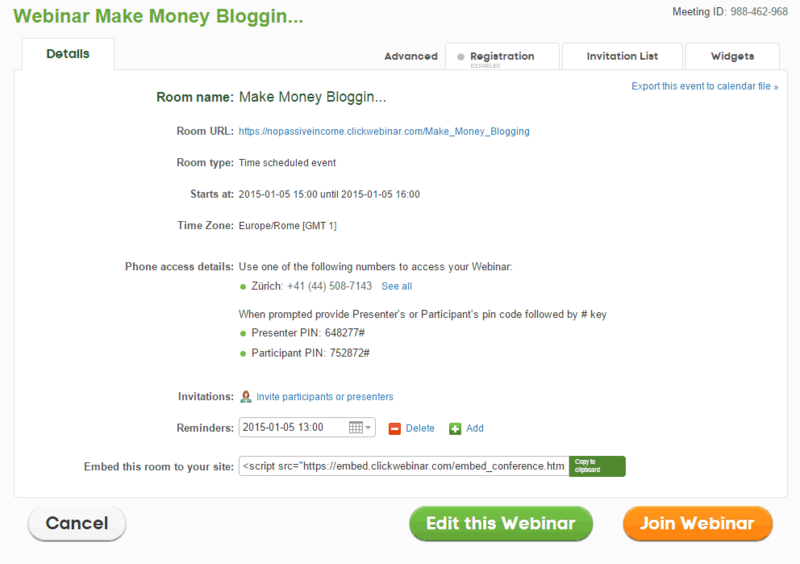 This is how ClickWebinar software will look like. In a few words, the dashboard for your event (click to enlarge). You can organize everything, by uploading the files you want to show during the event, by clicking on the icon of the presentation. You also want to set audio and video functions (to avoid unpleasant surprises later during the webinar). The “desktop” feature is great for showing what you are doing on your computer. While you can use the “YouTube” button, to simply display videos to your attendees. The “polls” feature lets you create surveys, to gather opinions and feedbacks, or run tests, to assign scores to answers. ClickWebinar has also a useful chat module (which is moderated). 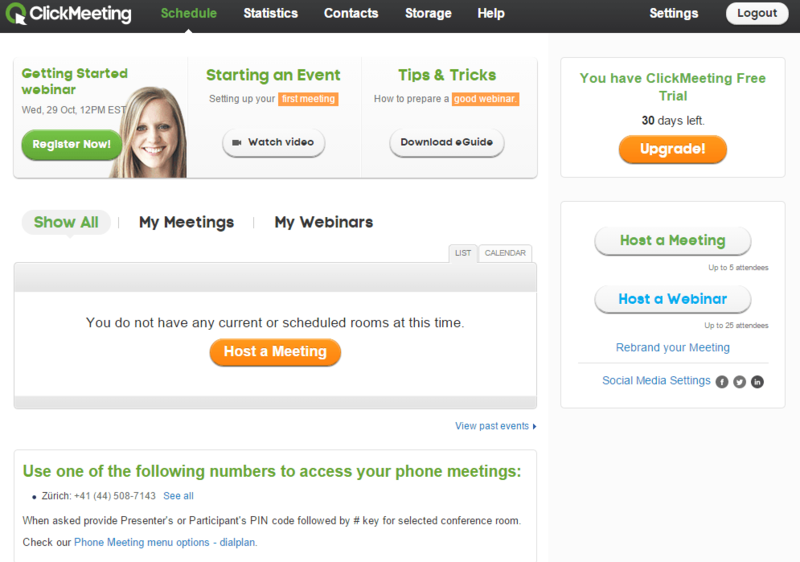 Finally, you can edit your webinar settings, by visiting the top right menu. For example, you may want to change the layout of your room, by enabling single window for the attendee list, chat or camera and voice. Plans depend on the number of attendees you’ll have. ClickWebinar has really a simple to use dashboard, with great interactivity tools (like moderated chat and polling). Also, the statistics you get after you finish a webinar are useful for tracking attendees and the resulting leads. 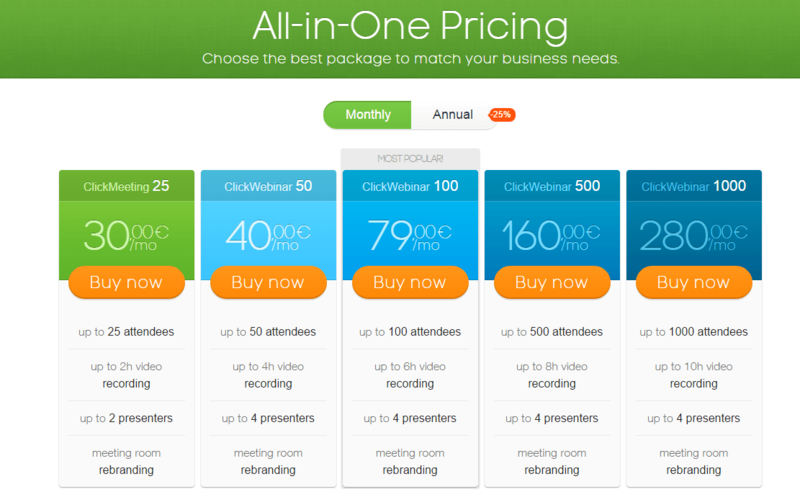 I’ll surely consider ClickWebinar as the software to use when organizing my first videoconference or webinar. Have you ever organized a webinar? Which platform have you used? I have always wanted to do a webinar though I am not ready now. However this is a great resource about Clickwebinar. They have great features and are affordable too. I am bookmarking this post for future reference. Thanks for sharing. Glad you liked the post, Ikechi. Webinars are a great way to showcase your knowledge and build more fans. Good to know you bookmarked the post. hi, It is true that webinars can boost your sales, but not everyone has access to webinars, this is due to so many factors ranging from poor internet connection to ignorance. glad you liked the post about webinars. Its really interesting knowing about ClickWebinar software. The features seems to be easy on individuals and businesses. What more can we expect from a program that is supposed to facilitate communication and enhance productivity. I think its worth taking a short accessing the 30 days trials! This comment was also shared in kingged.com as well. ClickWebinar is surely a software I’ld use if I start webinars in future. I like the simple to use dashboard and the interactivity tools (like moderated chat and polling) are great. Thanks for sharing this post with us. I haven’t tried my hands in Webinar. However, I have planned few days ago to do so. I came across this post at the right time I believe. Now I am looking forward to use clickmetting. Great to hear that, Nitin. I love how ClickMeeting works. It is true that webinars can boost your sales, but not everyone has access to webinars, this is due to so many factors ranging from poor internet connection to ignorance. I understand that in some countries and certain people do no thave the same possibilities. But this is the advantage of the internet, with your website or business online you can target all the world. I must say that you are awesome while reviewing the tools. Here you explained the full guide to get started with ClickWebinar. Thanks for going in such depth! Glad you appreciated the review. I have not done webinars before and have been thinking of adding that to my list of strategies in 2015. This tutorial post comes just at the right moment so I’ll be reading it closely and taking the tools you recommend. I appreciate the kind words, my friend. I hope this is going to help you for your next webinar organization. great well explained each and every thing in this post..thanks for sharing that webinars to boost sales. Glad you liked the post, Sazia. awesome decently clarified every last thing in this post..thanks for imparting that webinars to support deals. Glad you liked the post, thanks for commenting, Rahul. ClickWebinar is a simple and easy to use meeting software where you can deliver webinars online. The Software works well on Microsoft and Mac and is web based, its an intuitive software at an affordable price. thanks for sharing your experience with ClickWebinar.